This agritourism farm named "Skowronki" (skylarks) is one of the most scenic tourist farms in the Biała Lądecka Valley. Panoramic views, a lot of open space, forests nearby, tranquility and a home-like atmosphere make it a perfect place to rest and enjoy yourself. The main house was built almost 200 years ago. 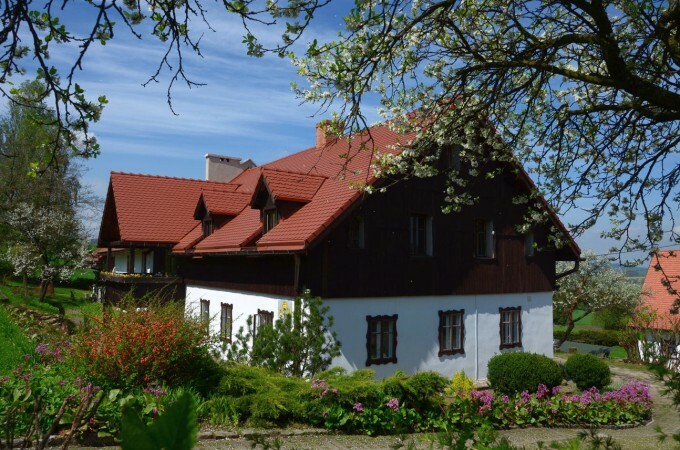 Adapting it to the current needs they have tried to preserve the original style of Sudety architecture to match the natural landscape of the area. They offer accommodation in four double rooms in the main house and one room for four persons in the little cottage, all of which have their own bathrooms. Rooms are being cleaned daily. You can use a common room with woodstove, a TV-set and Wi-Fi. Also there is a children’s playground and guarded parking. There’s even a closed room for bicycles and ski equipment. The specialties of the house are regional dishes with plenty of fruit and vegetables from their own garden. The advantage of this place is the proximity to Lądek Zdrój, one of the oldest health resorts where you can explore the culture, enjoy a bath in the thermal waters and try some natural healing treatments. There are also some interesting rock-climbing areas in Lądek Zdrój. This is truly a fantastic spot for spelunkers with Jaskinia Niedźwiedzia (Bear Cave) in Kletno (20 km). There are skiing opportunities nearby with two ski lifts in Nowy Gierałtów and Bielice; these are illuminated in the evening. But for the demanding skiers there is the ski complex “Czarna Góra” (15 km). It’s always worthwhile to visit the city of Kłodzko and its Historic monuments, including the fortress and the underground tourist trail. History buffs can also go to the historic gold mine in Złoty Stok. And for nature lovers there is the Stołowe Mountains National Park.